Pitch where you like in this 4 acre field. Choose from remote corners of the field or more central locations. 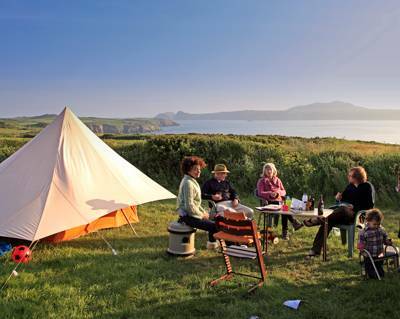 On the stillest of still nights at Walton West Campsite in Pembrokeshire you can hear the waves crashing along the coast. It’s less than a mile to the beach (less than a mile to two beaches, in fact) but all the same the soft crunch of water tumbling in upon itself is usually lost beneath a gentle chorus of other sounds. 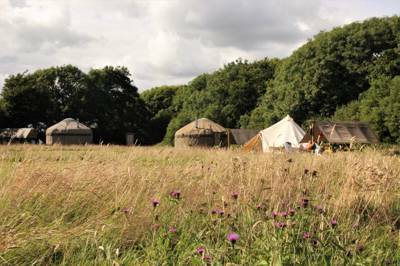 Campfires crackle, marshmallows bubble, wildlife rustles among the bushes and at dusk the resident barn owl can sometimes be heard. 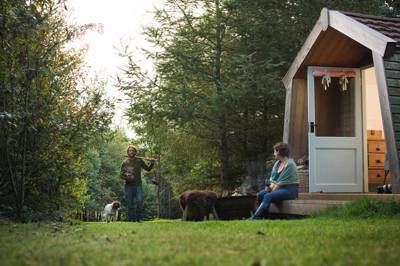 They are the sounds of traditional, no-frills camping. And for folks like us heading to the coast, they are exactly what we’re looking for. 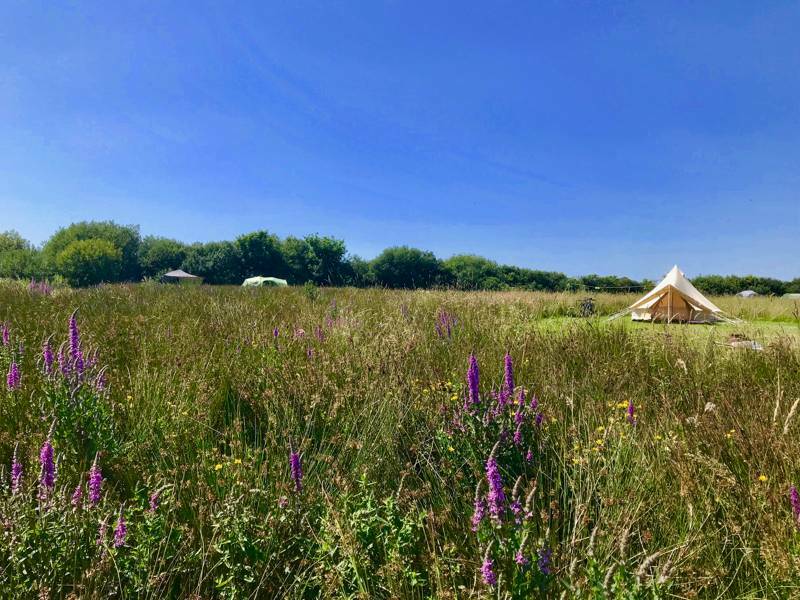 Set in an organic meadow, where short camping lawns have been mown into irregular aprons of longer wild grass, Walton West Campsite is a simple site of old with four flush toilets, a couple of hot showers and washing-up sinks, half a dozen fridge freezers but very little else besides. There are no electrical hook-ups – though small campervans are still welcome – and there’s no shop, café or playground. 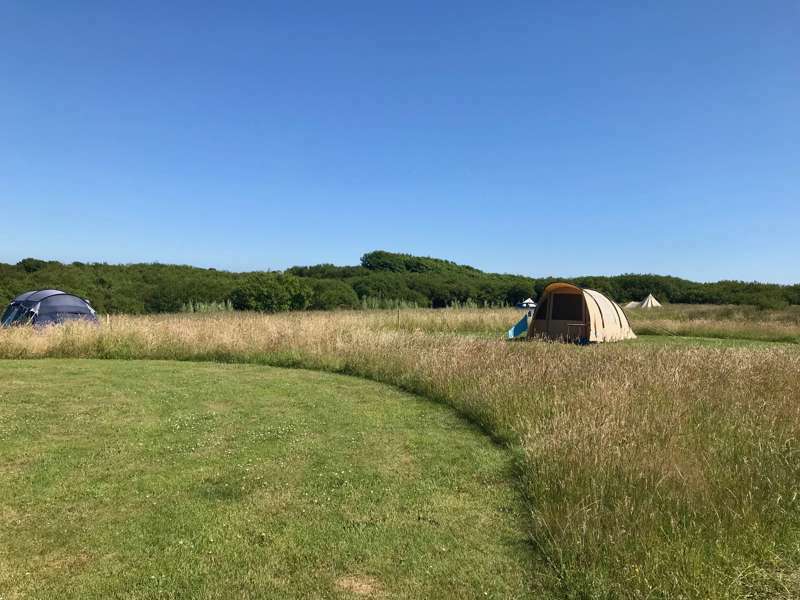 The entertainment here is more about having space, peace, being surrounded by nature and a cracking beach within easy reach. 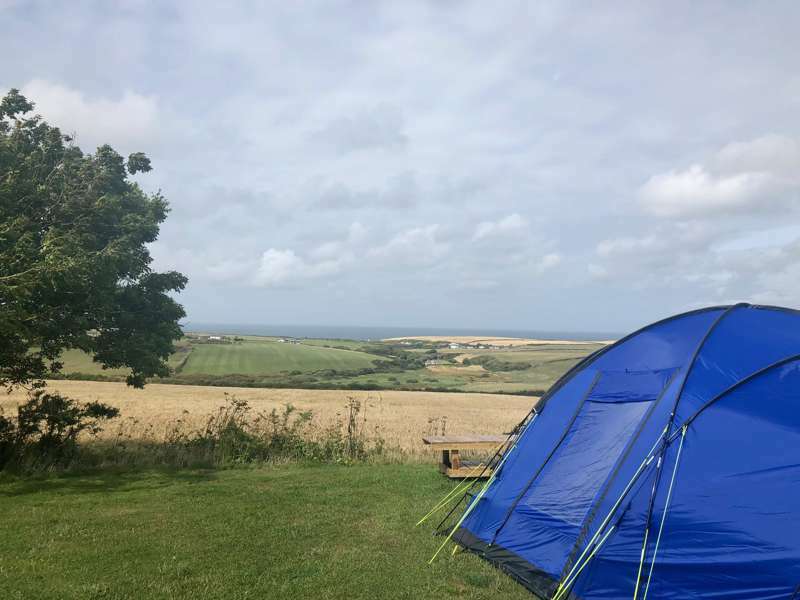 Little Haven is the closest – a picturesque fishing village with plenty of facilities (car parking, toilets, etc) and quaint village pubs nestled into a sheltered valley that opens up onto a beautiful golden beach. The sandy bay is dotted with rock pools and spectacular craggy formations to the sides, while there's easy access onto the beach itself – ideal for families with young children. It also offers safe swimming and surfing for all ages and abilities. Once you round the headland, the beach actually stretches much further, linking up with neighbouring Broad Haven. It’s here that you can hire water sports equipment to make the most of the surf, or retreat back onto land to snake your way along the Pembrokeshire Coastal Path. 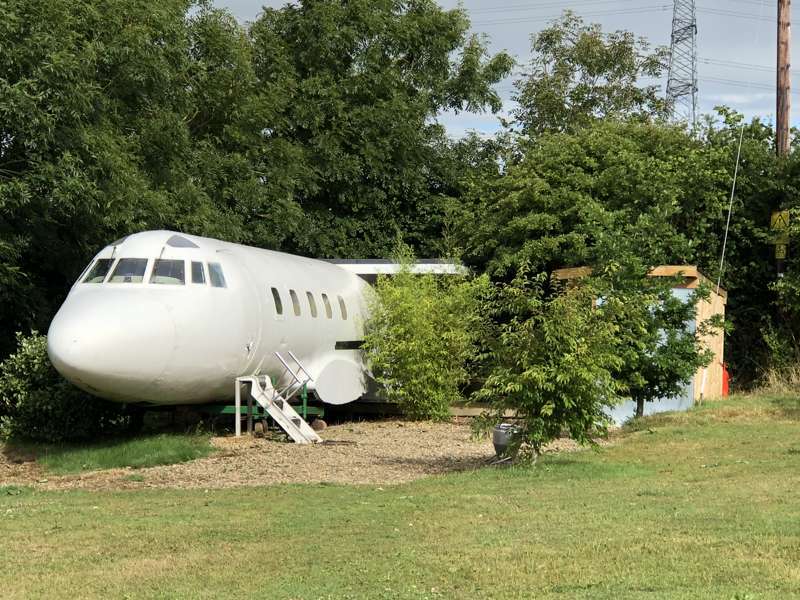 It too can be easily reached from the campsite. At night the skies remain wonderfully dark. 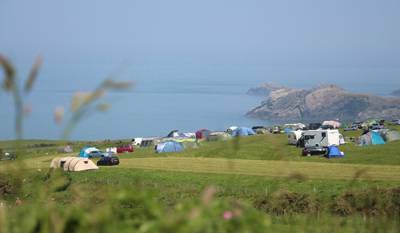 The campsite is within the Pembrokeshire Coast National Park and not only does this mean spectacular scenery and wildlife but also restrictions on further building, so there's no neon urban glow once the sun sets. Dusk means putting another log on the fire, wrapping up in a blanket and admiring the spectacular star lit skies. The unblemished nighttime views echo the Walton West ethos – that interference and manmade luxuries aren’t the way to enjoy the great outdoors and just leaving things alone works much better. 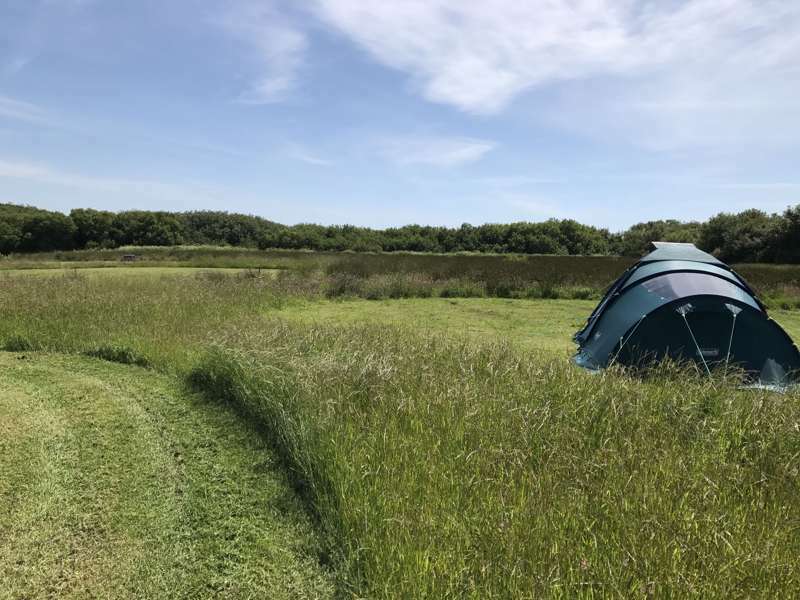 Walton West Campsite has, but for the basic facilities and the occasional trim of the grass, been left nicely alone for campers to enjoy. And isn’t that what camping’s about? 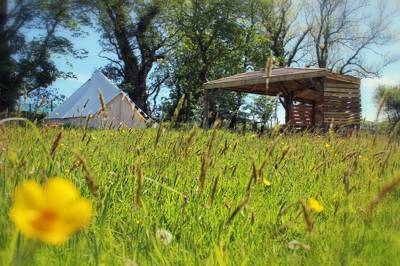 For latest availability and best prices for Walton West Campsite, please use the Date Search above. 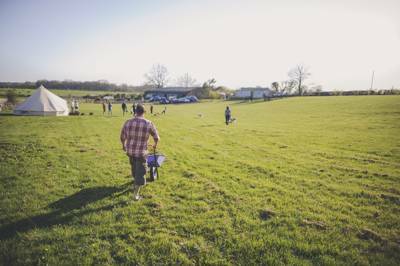 15 designated grass pitches in a sprawling 5 acre organic field. 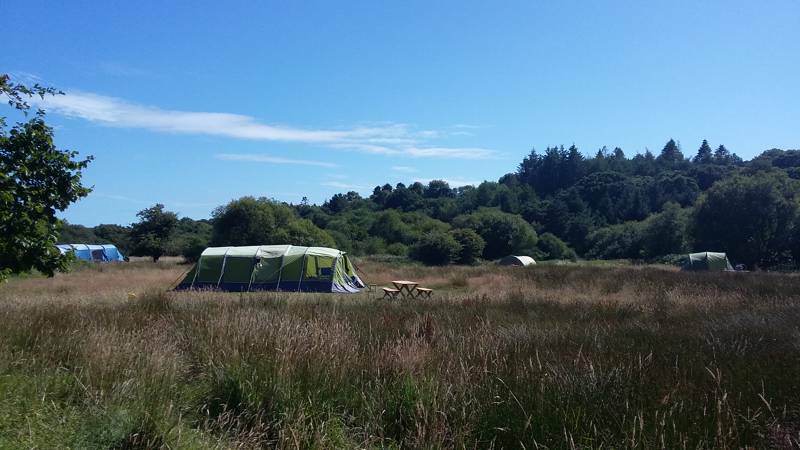 No electric hook ups and basic but clean toilet facilities: 4 flushing toilets, 2 electric showers (coin operated – £1 for 7 mins and all electricity provided by renewable energy sources), 6 fridge/freezers for campers to use, 2 washing up sinks with cold water and 2 fresh water taps out in the field. Campfires allowed – moveable metal braziers available free of charge with bagged logs and kindling for sale. 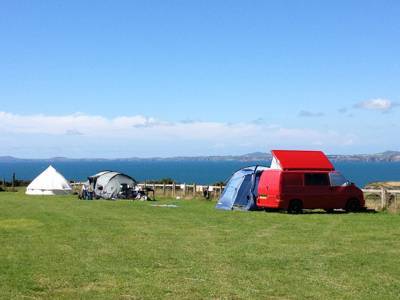 There are two stunning beaches less than a mile from the campsite – Little Haven and Broad Haven. 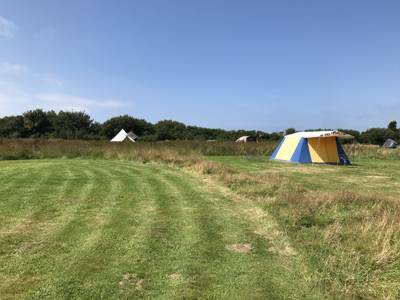 It's about a 15 minute walk along country lanes to each from the camping field, or a couple of minutes drive to either of the beach carparks. Both are excellent spots with rock pools for kids and great surf for those heading onto the water. Try the Haven Sport Shop (01437 781354) in Broad Haven for kayaks, surf boards and paddle board hire. At the beaches you can also pick up the Pembrokeshire Coastal Path, 186 miles of breathtaking coastal scenery. For a one way trip, walk and then pick up the Puffin Shuttle Bus at the other end, which will return you to Little Haven. Another particular highlight is taking the boat trip out to Skomer Island. The island nature reserve is surrounded by the clear blue sea of a marine reserve. The area is home to over 10,000 puffins, 300,000 manx shearwaters along with other species of birds, grey seals and porpoises. The Ocean (01437 781882) and The Seaview Café (the latter serving excellent fish and chips). For a pint or tasty pub grub, try The Castle Inn (01437 781445) or St Brides Inn(01437 781266) in Little Haven, or the Swan Inn (01437 781880), also overlooking the beach there. Springfield Farm sells fresh, homegrown produce a few minutes walk from the campsite (including free range eggs, salads, tomatoes and Pembrokeshire potatoes) and St David’s hosts a local farmer's market on Thursdays. There's also an excellent market in Haverfordwest on Fridays. Adults £10–£14, children (3-15yrs) £6–£8, under-3’s free. Dogs £3 per night. Maximum of 1 tent per pitch. Take the M4/A48 to Carmarthen, then the A40 to Haverfordwest, then turn onto the B4341 towards Broad Haven. Before you reach Broad Haven, as you're driving through the small hamlet of Broadway, pass the Broadway garage on your right and look out for the next left turning (on a sharp bend) signposted to Little Haven. Take this turn and, when you reach the very bottom of this hill (on the bend) you will spot the campsite track located on the left hand side of road. Turn left up the track and follow it all the way into the campsite. The nearest train and bus station is Haverfordwest. Buses do run to the nearest villages of Little Haven and Broad Haven from Haverfordwest but are not frequent. There is also the Puffin Shuttle Bus service, a coastal bus service that can pick up from various locations along the Pembrokeshire Coastal Path with pick up and drop off points at nearby Little Haven and Broad Haven.